Use the PPro8 Chart Window to display charts that can help with trading decisions. 1. On the PPro8 toolbar, click ChartWindow. 2. An empty Chart Window appears. A. 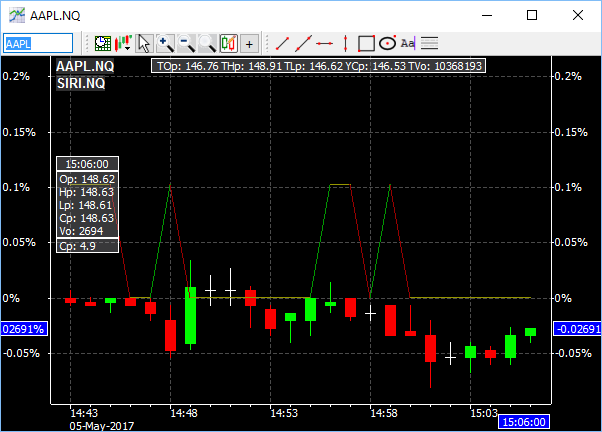 Symbol Box: type the symbol (for example, BB), press Tab, click the market extension (for example, TO), and press Enter to load the chart. B. 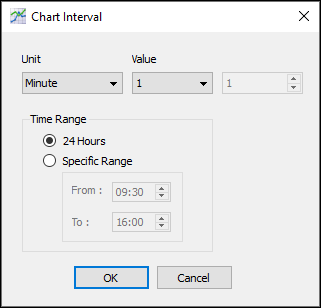 Time Interval: click to open the Chart Interval window, and type in values to set the time interval. 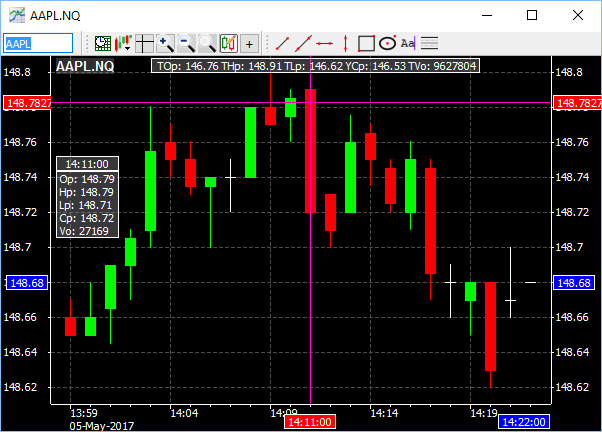 C. Chart Type: click the option for the type of chart you want to draw, either Candle Stick, OHLC Bar, or Long/Short Line. D. Cursor button: click either NormalMouseMode or CrossCursor to either add or remove a coordinate system to the cursor to help read time and price information. E. Zoom In/Zoom Out/Zoom Reset: click the appropriate button to zoom in or zoom out and view a specific interval movement. 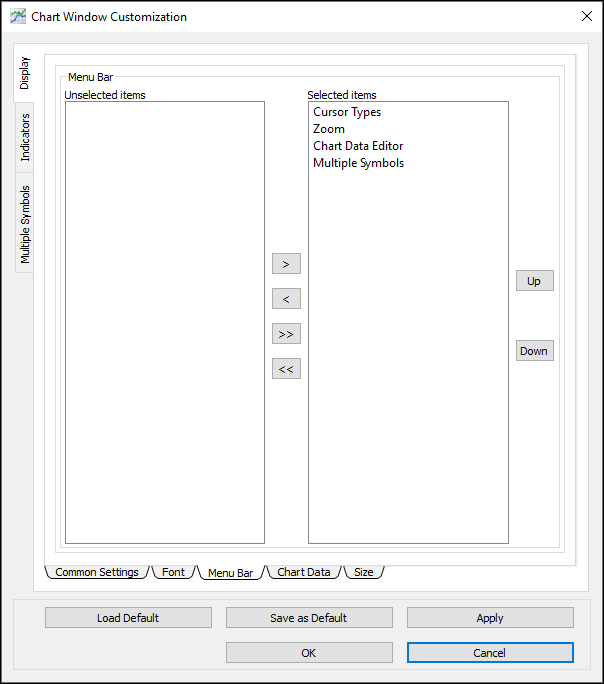 F. Data Editor: manually change the data that displays in the Chart Window. 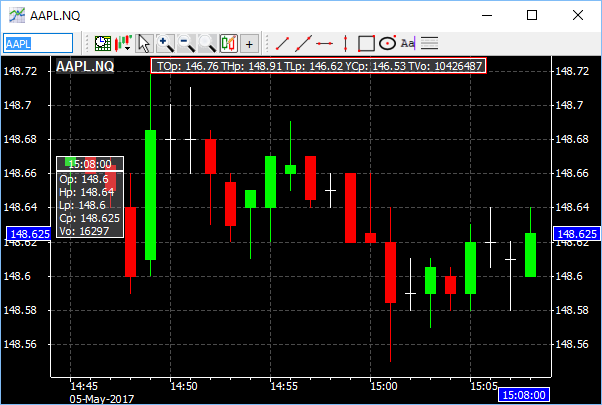 When a bad print appears in the Time of Sales window, it triggers a visible, incorrect change in price or volume in the Chart Window for a specific minute. You can set the Cursor to CrossCursorto identify the minute when there is a bar that needs to change. To make this change, open the Data Editor, type the correct value, click OK, and the Chart Window updates. 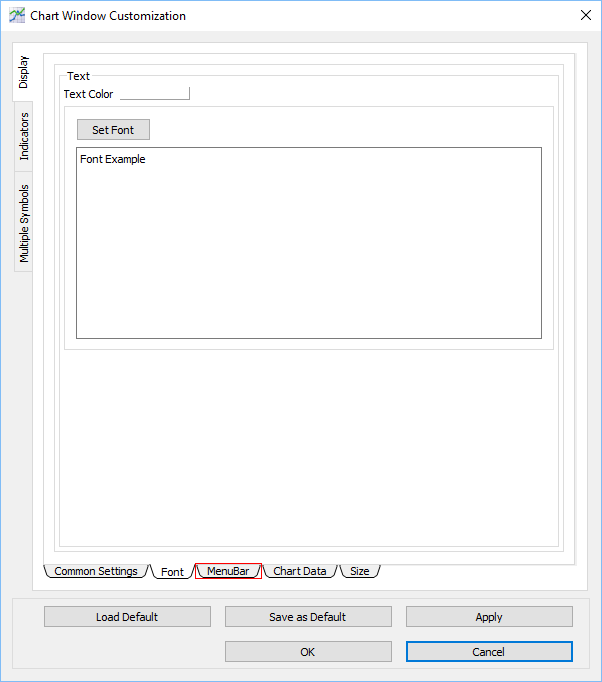 G. Add Symbol: click to open the Chart Window Customization: Multiple Symbols view, where you can add or remove multiple symbols for comparison in the Chart Window. I. OHLC Titlebar: view daily values, including opening price, high price, low price, yesterday's closing price, and volume. J. OHLC Info: view the symbol’s Open Price, High Price, Low Price, and Closing Price, as well as Volume, for the trading day. You can send orders when Chart Window is open and on Top. 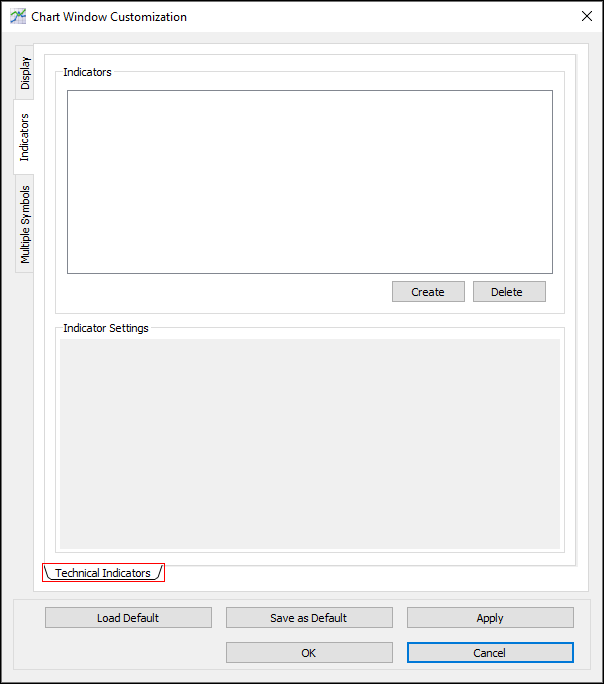 To use this function, enable the Order Edit Box feature in Customization, and then follow these steps. 1. Set up keyboard shortcuts with Keyboard Setup. 2. Open a new Chart Window. 3. Type the symbol and market extension, and then press Enter. 4. Type a keyboard shortcut. 5. The order edit box appears. 6. Edit the order (type values in the Limit Price and Shares fields as needed), and then press Enter to execute. 7. The order is sent from the Chart Window. Note: click SaveLayout on the PPro8 toolbar to make the order edit box remember its position on the screen when re-opened again. 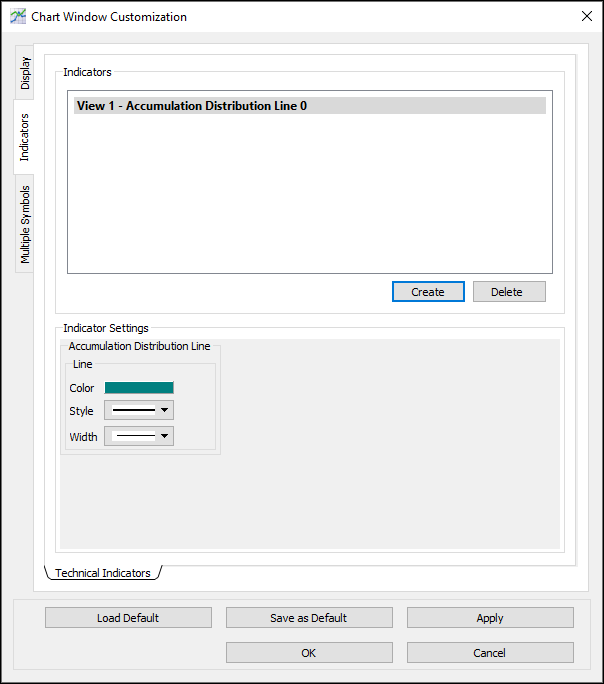 To make changes to the Chart Window settings, right-click anywhere in the Chart Window to open the Chart Window Customizationwindow. This window displays three main tabs on the left: Display, Indicators, and Multiple Symbols. Note: a symbol must be loaded in the Chart Window before you can open Customization. 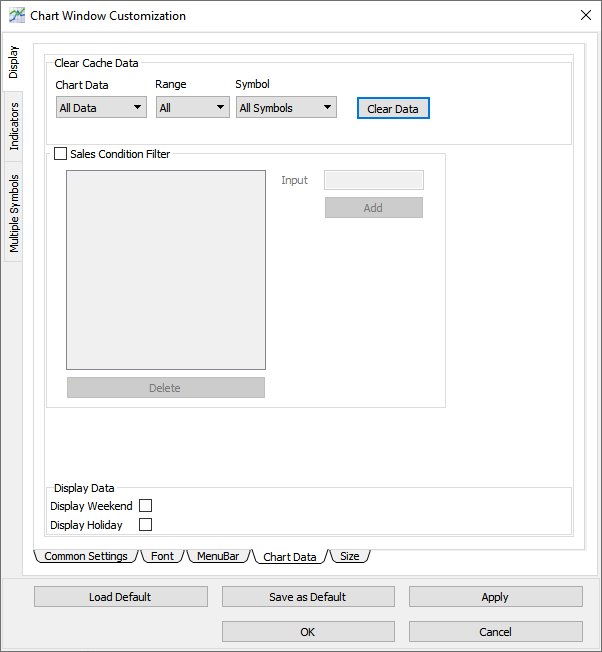 Use the Display window to adjust the display settings for the Chart Window. The Display window contains four sub-tabs: Common Settings, Font, Menu Bars, and Chart Data. Use the Common Settings window to adjust color and layout settings for the Chart Window. 1. Click the Common Settings sub-tab in the Display window. 2. The Common Settings window appears. 1. 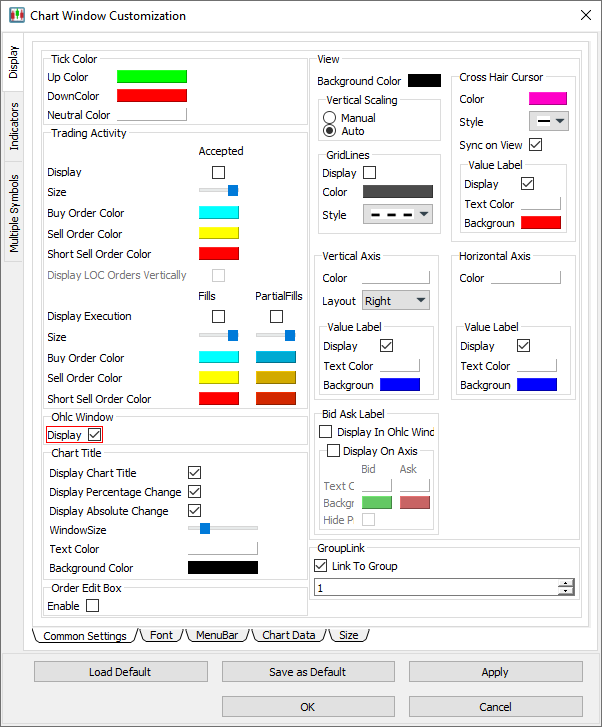 In the Common Settings window, double-click the color box for either of the three options (Up Color, Down Color, or Neutral Color). 3. In the Customization window, click OK.
4. The tick color is set. 1. In the Common Settings window, select or clear the check boxes for the Display Accepted Order and the Display Executionoptions to hide or display them. 2. Double-click the color box for either of the three color options (Buy Order Color, Sell Order Color, or Short Sell Order Color). 5. The trading activity options are set. Select or clear the check box for the Ohlc Window display option to show or hide the OHLC Window. Select or clear the check box for the Enable option to enable or disable the Order Edit Box feature in the Chart Window. 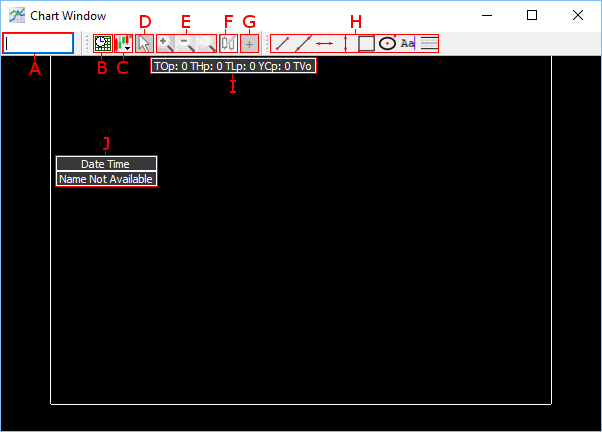 If this option is selected, the Chart Window is grouped by number with other tools, such as the Stock Window and the TOS Window. Other windows in the window group of the same number change their symbol to correspond to the symbol in the Chart Window. 1. In the View section, double-click the color box for Background color. 4. The background color is set. 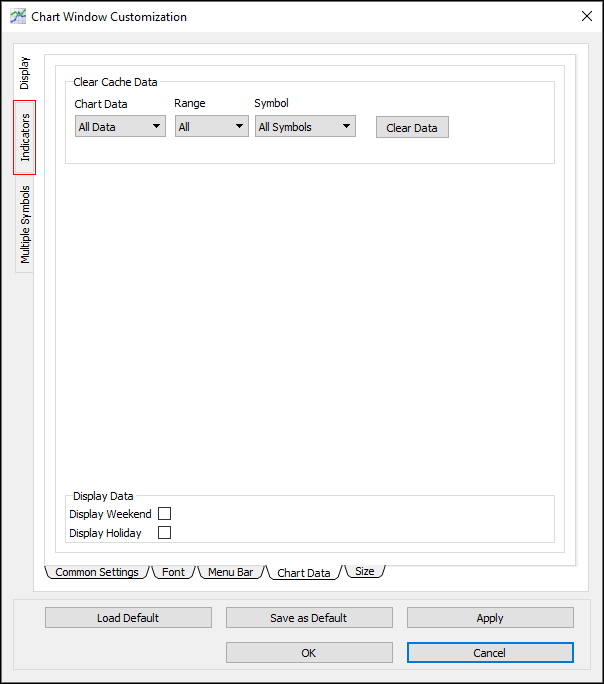 To hide or display indicator labels on the chart, clear or select the Display Chart Title check box. 1. In the Vertical Scaling section, click the Manual or Auto option to set vertical scaling to manual or automatic. 2. In the Customization window, click OK.
3. The vertical scaling is set. When vertical scaling is set to manual, clicking and dragging the vertical axis up or down changes the scale. 1. In the GridLines section, select or clear the Display check box to show or hide grid lines. 2. Double-click the color box, click a color, and then click OK.
3. Click the grid style you want to set in the Style menu. 5. The grid lines are set. 1. In the Vertical Axis section, double-click the color box, click a color, and then click OK.
2. In the Layout menu, click Left, Right, or Both. double-click the color box for Background Color, click a color, and then click OK.
5. The vertical axis is set. select or clear the Sync on View check box to sync or unsync. 4. The cross hair cursor is set. 1. In the Horizontal Axis section, double-click the color box, click a color, and then click OK.
4. The horizontal axis is set. 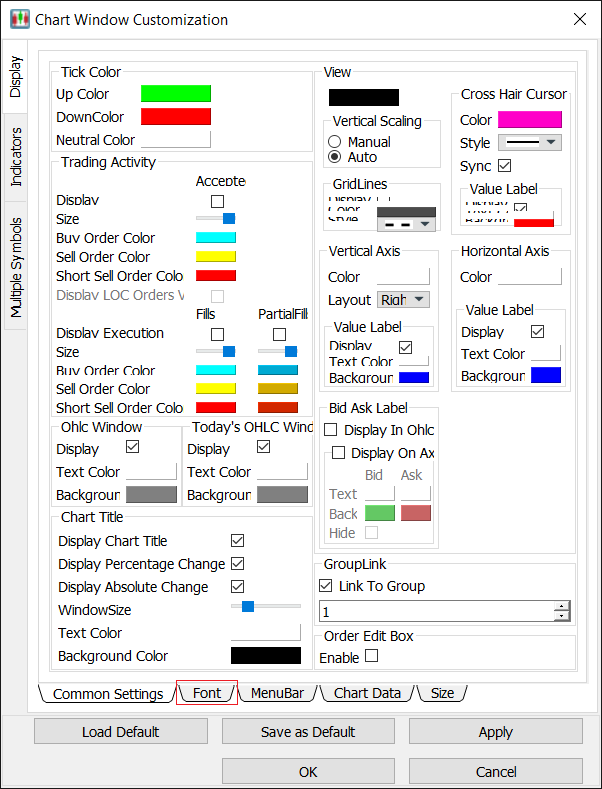 Use the Font window to set the overall font for the Chart Window. 1. In the Font window, double-click the color box for Text Color, click a color, and then click OK.
3. The Select Font window appears. 4. Click the font, font style, size, effects, and writing system you want to set. 6. In the Customization window, click OK.
7. The font is set. Use the Menu Bar window to show or hide icons from the menu bar in the Chart Window. 1. Click the Menu Bar sub-tab. 2. The Menu Bar window appears. 1. In the Menu Bar window, click an item in the Unselected items window. 4. The item appears in the Chart Window. 1. In the Menu Bar window, click an item in the Selected items list. 4. The item is hidden from the Chart Window. Use the Chart Data window to clear data from the Chart Window, and to hide or display weekend and holiday data. 1. Click the Chart Data sub-tab. 2. The Chart Data window appears. 1. In the Chart Data window, click the Chart Data menu, and then click an option (either All Data, Minute Data, or Day Data). 2. Click the Range menu, and then click All or Today. 3. Click the Symbol menu, and then click All Symbols or Current Symbol. 5. The cache data is cleared. 1. In the Chart Data window, select or clear the checkboxes for the Display Weekend and the Display Holiday options to show or hide weekend and holiday data in the Chart Window. 3. The chart data is updated. 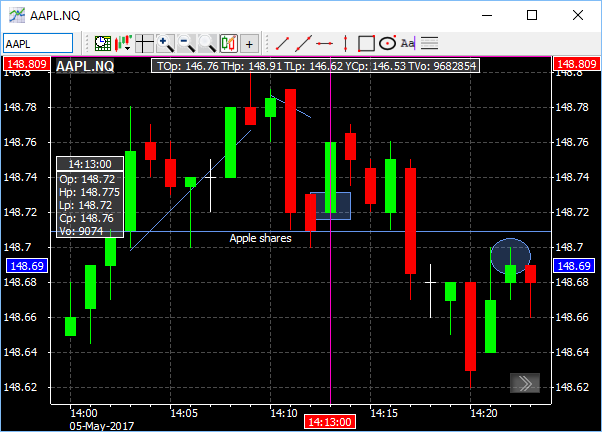 Use the Indicators window to adjust the indicator settings for the Chart Window. Click the Indicators tab to open the Indicators window. The Indicators window contains one sub-tab: Technical Indicators. 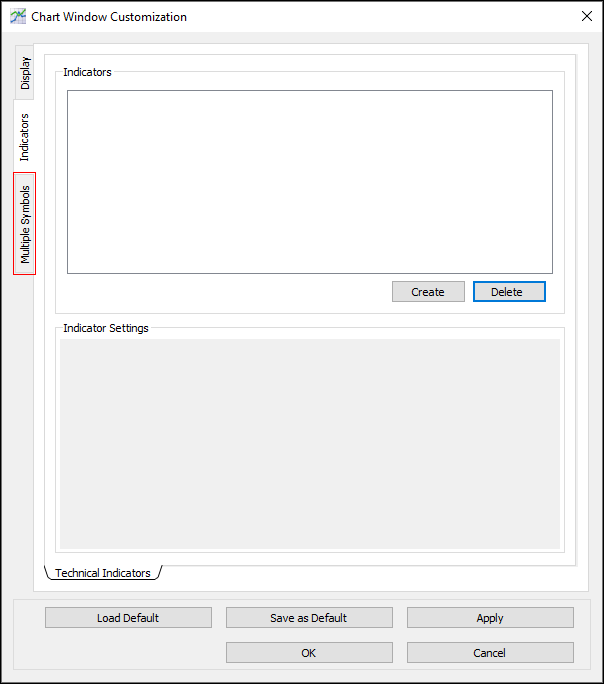 Use the Technical Indicators window to create, adjust, or delete technical indicators for the Chart Window. 1. In the Technical Indicators window, click Create. 2. The Create New Indicator window appears. 3. Click an indicator in the Available Indicators list. 5. The indicator appears in the Indicators section. 5. In the Indicator Settings section, type or click to adjust the indicator’s settings. 7. The indicator appears in the Chart Window. 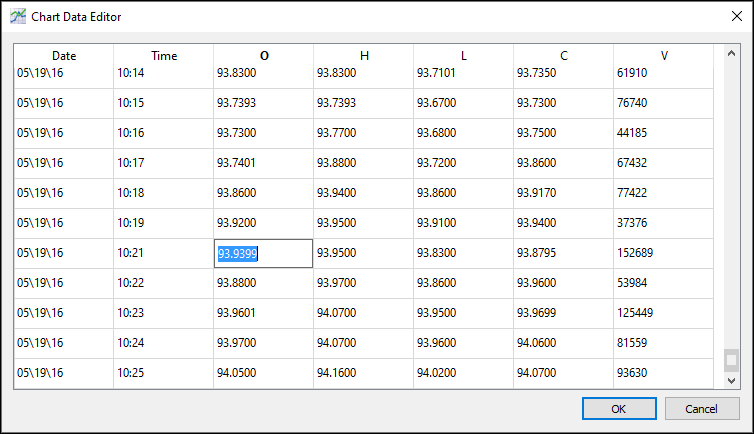 Use the Multiple Symbols window to add, remove, and compare multiple symbols from the Chart Window. 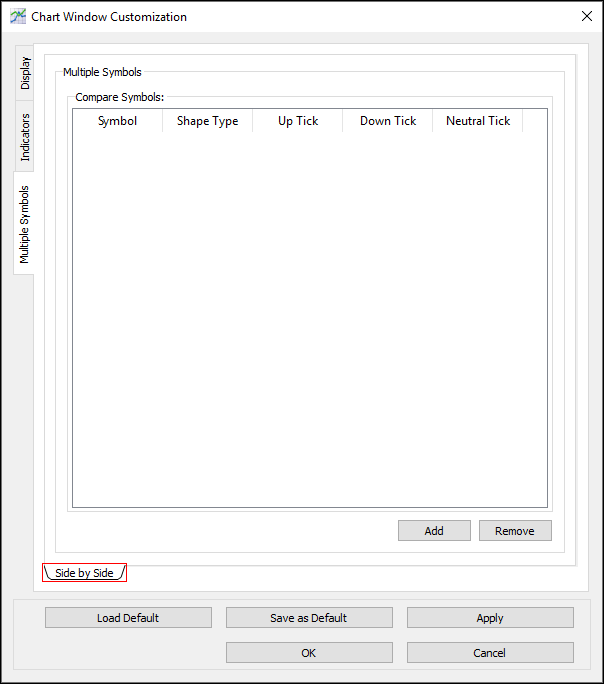 Click the Multiple Symbols tab to open the Multiple Symbols window. The Multiple Symbols window contains one sub-tab: Side by Side. Use the Side by Side window to compare symbols, side by side, in the Chart Window. 1. In the Side by Side window, click Add. 2. A row appears in the Compare Symbols table. 3. Double-click each cell in the row and type or click the symbol, shape type, up tick color, down tick color, and neutral tick color you want to set. 5. The symbol is added to the Chart Window for comparison. 1. In the Multiple Symbols window, click the row for the symbol you want to delete. 4. The symbol is deleted from comparison in the Chart Window. Use the OHLC window to show OHLC values for daily and time-specific values. The OHLC title bar shows daily values, and the OHLC window shows data points. 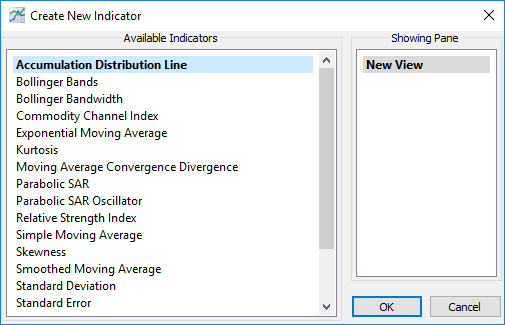 To show or hide the OHLC window, select or clear the check box for the OHLC Window display option in Chart Window Customization: Display: Common Settings.